Nick Markakis has just two home runs thus far this season, and is on pace to hit just 9 on the year. I think it’s relatively clear now that Nick isn’t really a power hitter – he’ll get his share of homers but is more of a doubles hitter who is content taking outside pitches to left-field. “His share” though, has been quite low in 2010. I’m not saying I’m worried yet – the season is long and the ZiPS updated projections still has him finishing with 17 homers (only one less than last year) – but it is a bit curious. 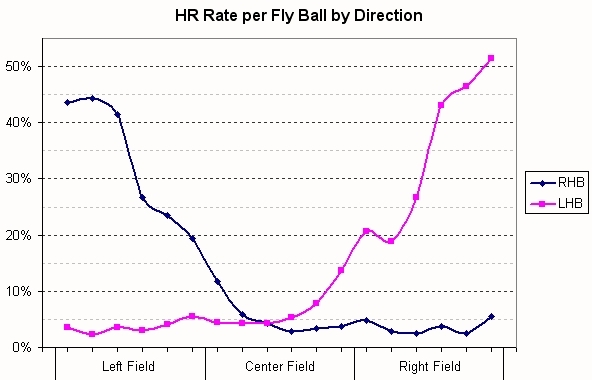 Last year Nick hit a much higher proportion of flyballs to right-field, which helps explain why almost all of his home runs (14 of 18) were to right. This year, not only is Markakis not pulling flyballs but he’s also not hitting as many to the opposite field. Center-field is the deepest part of any park, and a full half of Nick’s flyballs are going out there. No wonder they’re not finding seats. I’m not really sure why that’s happening – likely mostly normal variation – but Nick is getting a lot more fastballs and he’s done a pretty terrible job of getting around on that the pitch so far. Right-field on that last one is pretty barren. I thought that maybe Nick hasn’t been able to catch up to a good fastball, but his contact rate against heaters at 94 mph or above has actually gone up the last three years; from 71% to 85% to 93%. Perhaps he’s more content to just make contact than to try to drive the ball. The spray charts for all pitches tell a similar tail; not all that many balls being driven to the “warning track”, or to right-field. Nick’s 5% HR/FB rate is well below his career mark of 10.6%, as well as last year’s career low of 8.6%. I’m not might sure exactly how much we can expect that rate to go up this season, but I do think it’s clear that if Markakis doesn’t start pulling the ball in the air at least a little more often his power numbers won’t be particularly impressive at the end of the year. Many of you have submitted articles to FanGraphs that we’ve been unable to publish because there just hasn’t been a place for unsolicited article submissions. With the FanGraphs Community Blog, we now have a place where we can accept your original work. – Each article is subject to approval. We have no idea what kind of volume we will get on article submissions, but we will do our very best to get to every single article within 24 hours. – Your submission must be your original work. Do not submit articles you have not written yourself or that have a large amount of material that is not of your own creation. – Your submission does not need to be unique to FanGraphs. If you have written a piece for your own blog and think it would work particularly well on FanGraphs then you may submit it for approval. – You may submit a maximum of 2 articles per week. Submitting an unreasonable number of articles will result in having your posting privileges revoked. Other than that, we’ll see how it goes and adjust the rules accordingly. Once the blog gets some posts in it, we’ll start to further integrating those posts into FanGraphs and give it some additional publicity. If you have any questions, or issues submitting your posts, please fill out a contact form.